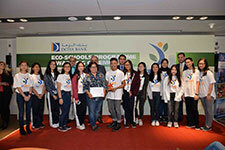 Doha, 21 January 2017: Doha Bank announced today the recipients of its annual ECO-Schools Programme Awards, a nationwide initiative that aims to recognize students and schools in Qatar that play an active role in propagating environmental awareness and implementing good environmental practices. 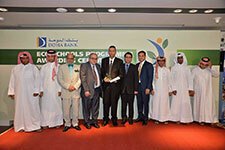 The ECO-Schools Programme Awards were presented this year to 12 schools in Qatar across three categories. The Awards acknowledge the exceptional creativity and innovation demonstrated by these schools in successfully completing their green projects as part of the ECO-Schools Programme. 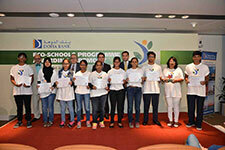 The Green Trophy, which rewards excellence in the “Environmental Health” category, was awarded to three schools: Al Ahnaf Bin Qais Independent Preparatory School for their ‘Hanging Garden for Ornamental Plants’ project, International School of London - Qatar for their ‘Rooftop Garden’ project, and Rajagiri Public School for their ‘Organic Farming-Vegetable Garden’ initiative. The Yellow Trophy representing the “Energy Saving” category went this year to Shantiniketan Indian School and Philippine International School Qatar-Elementary, for their respective projects ‘Energy Conservation’ and ‘Conservation of Electricity in PISQ’. Seven schools were presented with the Red Trophy in the “Waste Management” category: Birla Public School for their ‘Swachhta Abhiyaan - Cleanliness Mission’, Pakistan International School Qatar for their ‘E-Waste Management’ project, Gheras International School for their ‘We instill today…you reap tomorrow’’ project, Philippines International School Qatar-High School for their ‘Waste Management: Recycling’ initiative, Doha Modern Indian School for their ‘Waste Management’ project, while Philippine School Doha secured two awards this year - one for their ‘ECO-Fashion and Recycled Products Fair’ project and the second for the ‘Composting by using waste paper, fruit peels and kitchen refused materials’ project realized by their High School and Intermediate division respectively. “Our ECO-Schools Programme is open to all schools in Qatar, and aims to promote awareness on eco-cultural development by shifting the schools’ mindset into going green for a sustainable future. The Programme provides substantial opportunities to schools to explore various environmental concepts that can be implemented, improved, developed or retrofitted at their respective premises, thus serving as a platform for schools to contribute to the socio-environmental and intellectual development of the human society,” he added. 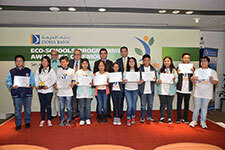 Apart from the school awardees, the ECO-Schools Programme Awarding Ceremony was also attended by officials from various Universities all around Qatar. There was a knowledge sharing session with Prof. Adnan Hamze, President of Arts, Sciences and Technology University in Lebanon (AUL). 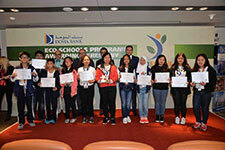 “Doha Bank’s ECO-Schools programme provides substantial opportunity for children to become environmental advocates at a young age and what’s best is that joining it is totally FREE-OF-CHARGE. 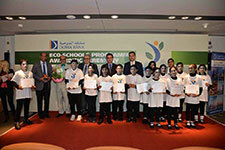 Once registered, schools to follow a simple process which will guide them to address a variety of environmental themes and achieving awards as they demonstrate their commitment to make a difference to the environment and the society,” Dr. Adnan said. 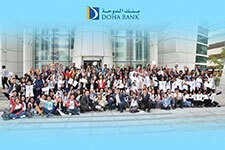 “Doha Bank’s ECO-Schools Programme guides, assist, supports and work with the student action teams within schools on their journey towards sustainability by providing a framework to help embed these principles into the heart of school life,” he added.